My title is describing a rave. Have you ever been to a rave? It's full of bright colors, bright lights and bright music. Sure, you're surrounded by a lot of people who are probably on drugs, whether that be ecstacy, alcohol or some sort of psychadelic, but honestly, if you like the music, none of that matters. I've been to lots of raves, mostly when I lived in California, and I always had fun. If you hate electronic dance music, you would hate them, unless of course you went for the drugs, in which case you would love them...and everyone that goes to them. Either way, they're a pretty fun experience, and I'm glad I got the chance to go to some amazing ones. One of the best I've ever been to was the Electric Daisy Carnival in Los Angeles. It has since been moved to Las Vegas due to safety issues at the Colosseum, but it was amazing the two years I went. It was by far the brightest rave I've ever been to, and rightly so, being in the middle of summer and selling some of the highest number of music tickets in history. To honor the awesome times I had there with some awesome people, and to honor the names of the polishes used for this manicure, here's Happy Go Lucky (China Glaze), Uninhibited, and Provocative (L.A. Girl). Looking back, I should've stopped with Provocative on top of Happy Go Lucky, but it just didn't look like enough at the time, so Uninhibited joined. It's certainly not bad, but maybe too busy now. That's raves for ya though! I used to when I was younger, it was a lot of fun. These are really cute nails... I have those colors except for Provocative. Provocative is pretty generic. You could pick up almost any fuschia glitter and get the same results. It's not as difficult to imitate as Uninhibited is. AM loving this yellow!! So pretty! This is a really fun look...def rave appropriate hehe! I just discovered LA Girl Glitter Addicts last weekend and I'm so freaking crazy about them!! I got Nostalgic, Celebrate, and Euphoria and I can't wait to buy some if the other colors! I just picked up these colors at Rite Aid last night!! I'm going to put them over a fun yellow! Thanks for the idea! 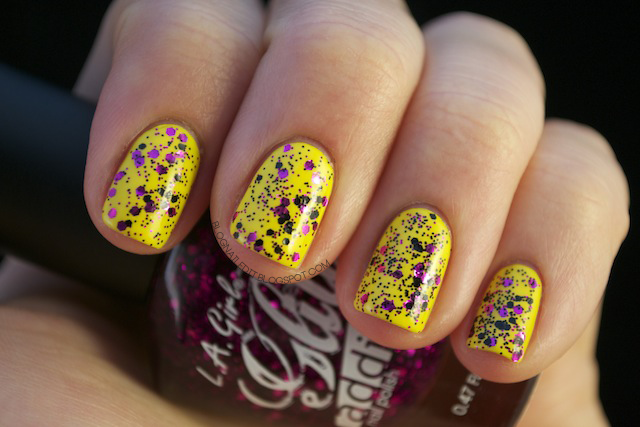 I really like this mani, the combination is very cute. Hmm I've never been to a rave before. I love your mani and its tribute!